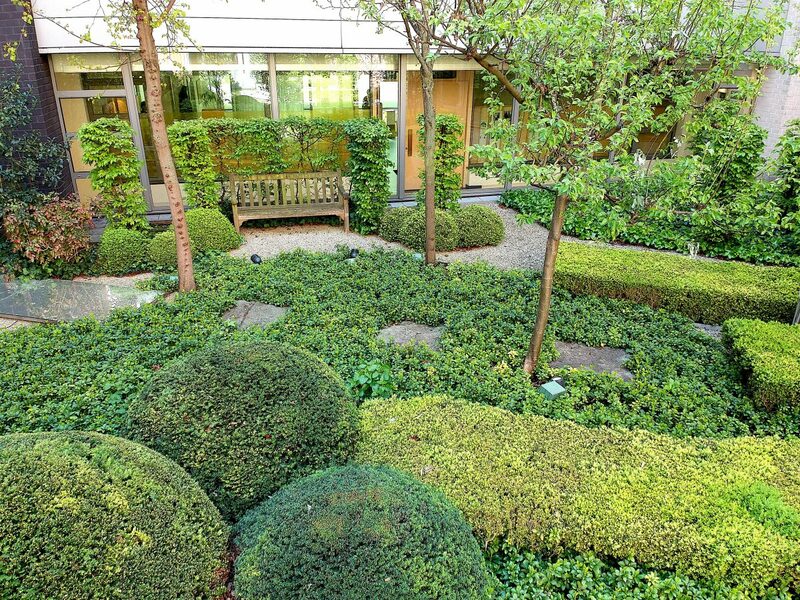 In this magnificent estate, we have created a more intimate garden around this family home. It was necessary to give a little privacy without breaking with the beautiful whole area. 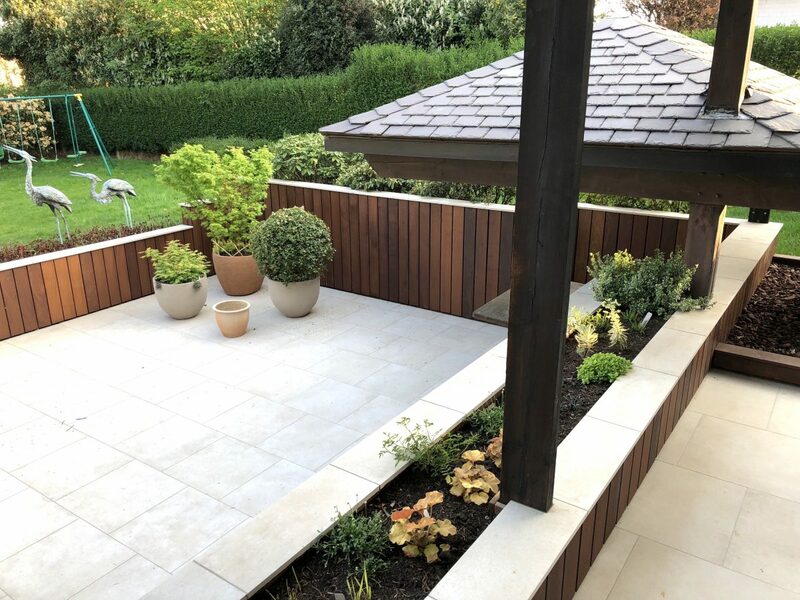 A beautiful wooden terrace, arches, gravel driveways traced by metal borders, many different species of plants for hedges and flower beds. The light has not been forgotten, to highlight the different sets of plantations. Three spaces of vegetable gardens increase the impression of intimacy. In this residence, each owner has his garden, and each owner wishes to personalize it by respecting the general norms of the residence. We traced large beds while leaving a piece of gravel traced by metal borders. The front and back of the garden have been connected by a driveway in large shale slabs on the side of the house. We can realize the gardens we create, at the request of our customers. We have the skills to carry out all the work. The layout of a garden is often more than plantations or pruning. 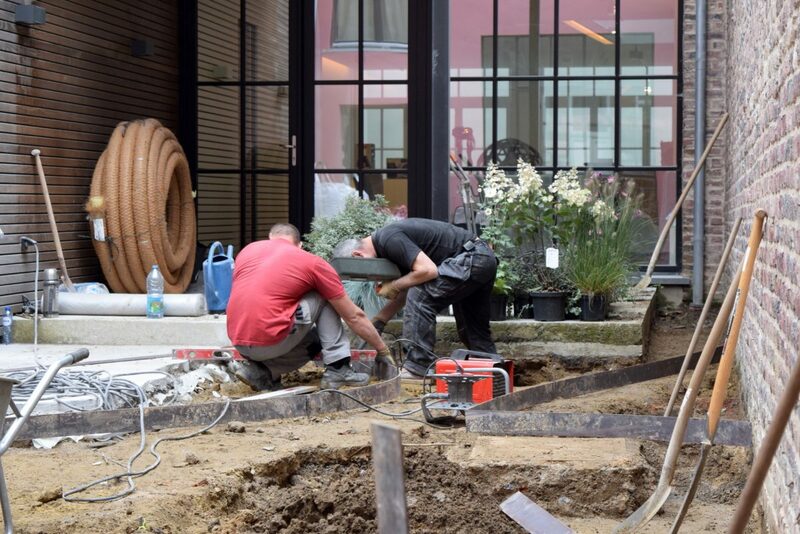 It may be necessary to prepare the ground by earthworks and drainage, to build a terrace, and paths - wood, Belgian bluestone or gravel, with metal or stone borders ... It is also necessary to provide lighting. and automatic watering in some cases. Other works may include a pond, a staircase, works of art. To complete this terrace, the owners asked me to add compound plantations in a set of beautiful fixed and mobile bins that I chose with them. We have also created a vegetable charm! 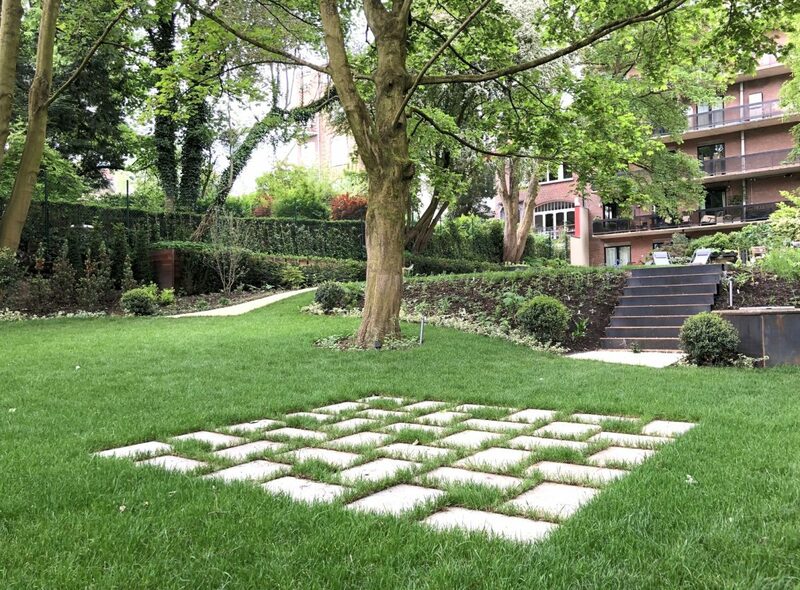 This large space was a challenge because before planting, it was necessary to renovate the earth in depth to drain and restore all its qualities. 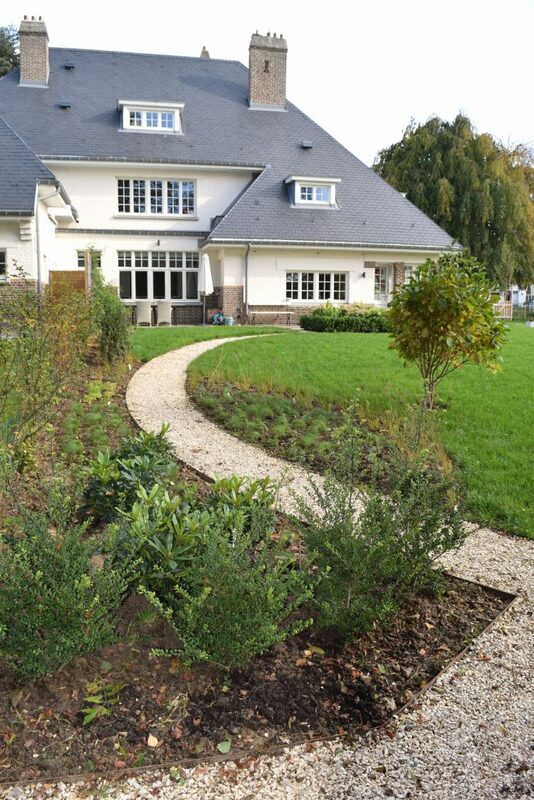 It was also necessary to sow a real lawn ... We were then able to draw beds of grasses and perennials, to install compound hedges ... We drew a beautiful curved driveway - in gravel and metal border - and a bed of Hydrangea Annabelle that forms a beautiful square in front of the house. 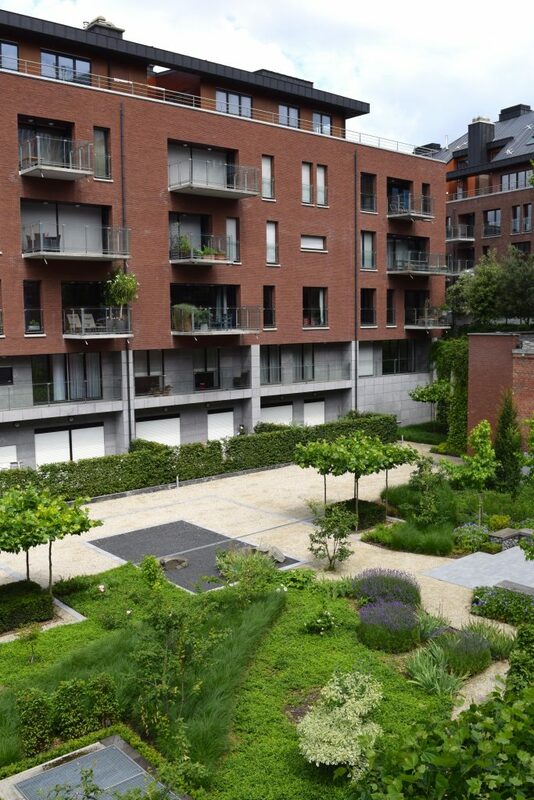 We have completely renovated this space with a blue stone and gravel terrace, flowerbeds and trees all around. We brought the lighting, and integrated this pretty basin with fountain. We have not forgotten to repaint all the walls to increase the effect of light! A mirror enlarges the space. Nathalie Devallée was awarded the Jules Janlet Prize 2004 for this project. The management of the Clinique Saint-Jean opened in 2002 an extension boulevard du Botanique in Brussels around an outdoor patio on several floors. With its hotel-clinic concept, patient comfort must go beyond the purely medical dimension, and promote healing through a comforting environment. The patio is the gravitational center of the building, visible from visitors as of the reception, but also patients, on a half-dozen floors. It had to make sense from all angles, at man's height but also in a dive perspective. Our landscaping project had to be original, and we had carte blanche. So I let my heart speak and call on Roberto Burle Marx (1909-1994), Brazilian landscape painter and botanist (Copacabana in Rio, new city of Brasilia, etc.). I visited his design office and his foundation in 1995. I wanted to pay homage to him by inspiring me of his graphic works, and by resorting to special species, medicinal. It had to be creative and efficient: the graphic dimension is on the upper parts of the patio, it hides the sealing installations and connects them visually to the lower parts. Since the patio space is not physically accessible, it had to be made attractive to the eye without creating frustration. I also connected the surface to the sky with specially designed stainless steel columns and I designed a plant system that takes up very little soil thickness because it is placed directly on the roof of the operating room. The implementation of the project required 120 tons of sand, 140 tons of earth, 6 tons of blue stone, 420 m2 of draining panels and 300 meters of electric cable. Partners: Emile Verhaegen Architecture Office of Brussels, Maurice Delens Momentary Association, Louis De Waele, Jacques Delens for the works. This garden was visited by participants of Garden Tales. This garden was a dreadful wet plain surrounded by a huge embankment and giant hedges that were stoling 30 square meters to the owners! All this has been transformed into a series of planted terraces. The light effect is particularly appreciable! We also remodeled the field and put a lawn in rolls. A gravel area with metal borders hosts a bench, and a hammock in summer. Other flowerbeds and fruit trees surround the lawn. The owner of this garden wanted above all to clear the garden. We laid a new lawn in rolls, laid out the bottom with a gravel space with metal edging, installed a wood shed and carved the two side hedges identically. We also drew space for flowerbeds that the owner planted later. 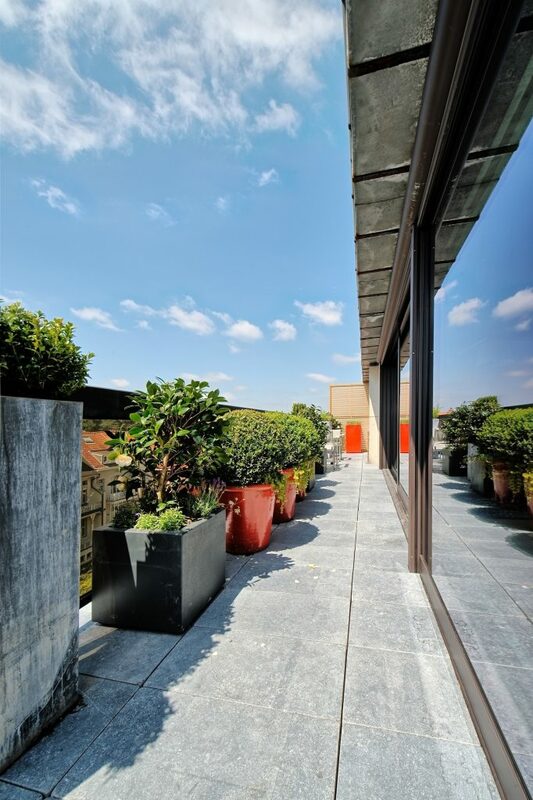 For this apartment located above a business, the terrace had to remain both minimalist and be protected from view. We chose this set of very slim design pots that matched the artificial grass already in place. This large house needed a large, elegant paved parking lot. It was important to balance this large area with large hydrangea beds, underlined by lower plantations. 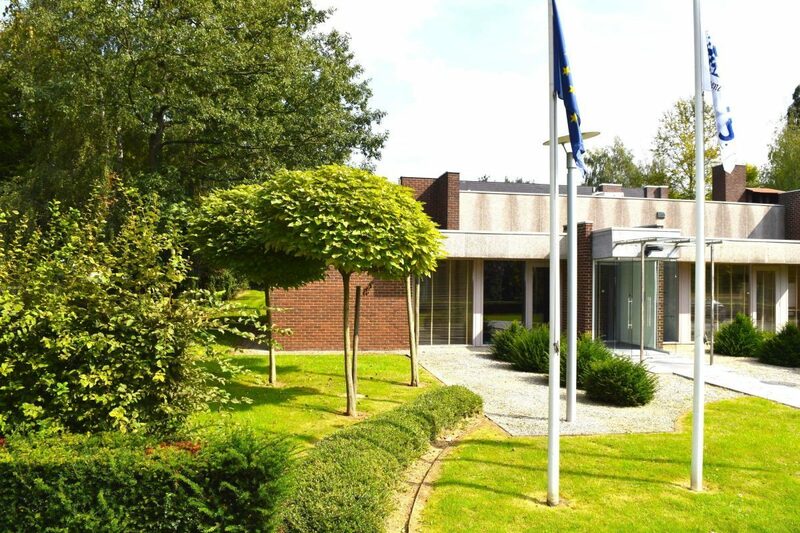 Deze tuin werd bezocht door deelnemers van Garden Tales. This garden adjoining an artist's studio is located between two houses and two high pink walls. We continued this set with pink gravel from Italy, small hedges and varied softly flowered beds. A beautiful potted palm comes to sign all. We also installed the lighting. This garden was visited by participants of Garden Tales. We have joined the gardens of these two houses to open a large reception area for professional use. The walls have been repainted and trimmed with trellises, flower beds delimited by metal borders have been arranged all around the garden and at the foot of the central tree. We have installed three corten steel bins for various other plantations. A sculpture by Jean-François Jans has been added. The existing terraces were completed by a bed of warm colored gravel. This garden keeps all its depth in the evening, thanks to a new lighting. We have joined the gardens of these two houses to open a large reception area for professional use. 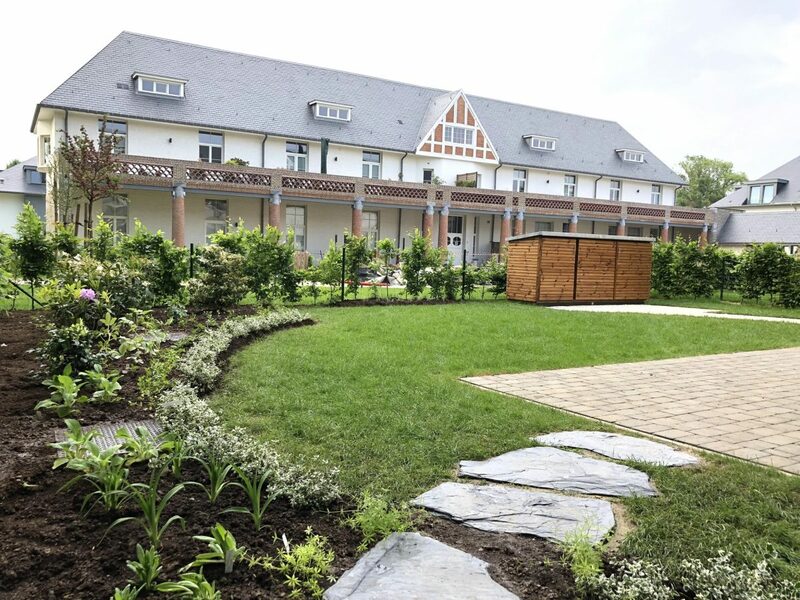 The walls have been repainted and trimmed with trellises, flower beds delimited by metal borders have been arranged all around the garden and at the foot of the central tree. We have installed three corten steel bins for various other plantations. A sculpture by Jean-François Jans has been added. The existing terraces were completed by a bed of warm colored gravel. This garden keeps all its depth in the evening, thanks to a new lighting. Several mirrors enlarge the space. 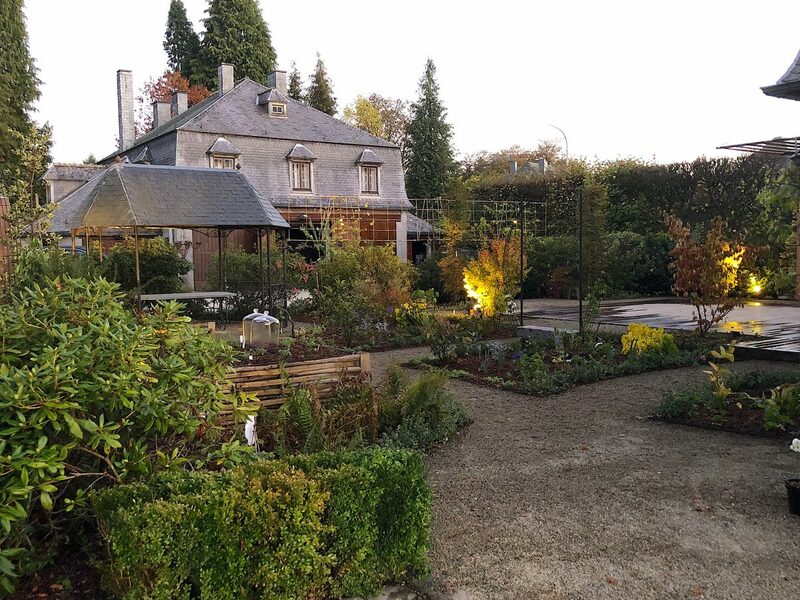 This garden was featured in the television show "Jardins et Loisirs". In this small meadow in the garden, we organized the view: a hedge doubled with a bed, a bench on a corten steel plate, two trees to frame the bench. We also dressed the garden shed with a carpet of pebbles and plants, encircled by a metal border. In this large park, we participated in the improvement of some flowerbeds. The owners of this house in the country wanted to build the front of their house in a very proactive way. We built a terrace with a fence, a staircase, flower beds, lighting in the ground and a paved area for vehicles. We have set up wooden doors to also access directly to the back by the sides of the house. On the sides and at the back, we also went to install flower beds and set up lighting. This large terrace on the roofs in the city needed to be highlighted without disturbing the cat ... We have installed large colored polyester bins of different sizes for plantations, and decorated a large wall with a trellis with geometric design to give it a presence. It's a project I designed and coordinated just before starting my own business. This magnificent luxury residence near the Ministry of Foreign Affairs was designed and built by EGTA. I realized two different gardens. The first garden is on the edge of residence; it is not accessible to the public. So I put emphasis on the landscape dimension, including a large rectangle of gray gravel to assert its presence. The second garden is in the center of the different buildings of the residence. I therefore favored the circulation of people while creating a dense space of plantations. It's a project I designed and coordinated for a couple of friends, before starting my own business. This very classic city garden has been designed and decorated as a part of the house: the flower beds are like pretty furniture! This garden that I designed before starting my own business is in the countryside. I imagined it as a recreational space with several compartments, playing with a pool, the swimming pool, and the arrangement of plantings of various beds to spare some surprises. This beautifully renovated apartment needed terraces of the same level, despite the limited space. I designed this project before creating my company, investing above all in the quality of the pots and great precision in their implementation. The floor in slabs of Belgian blue stone gives a "garden"touch to the whole. 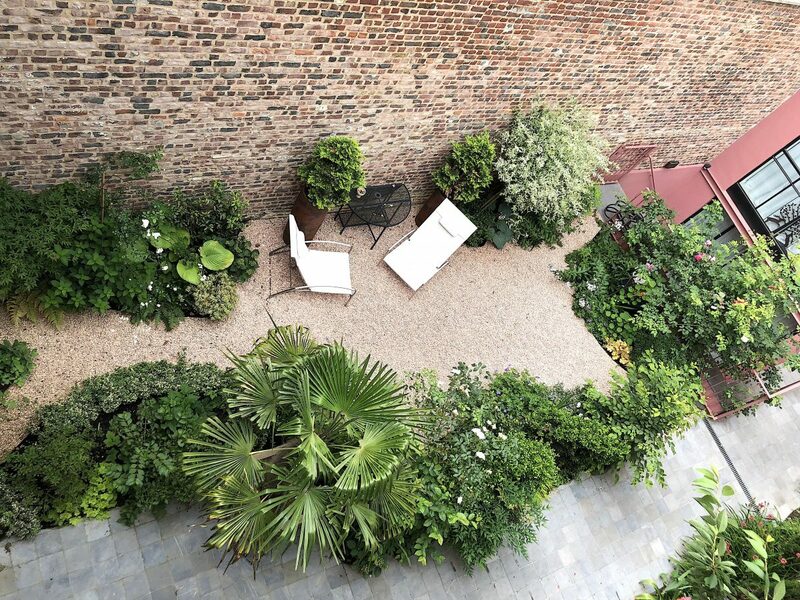 This terrace was featured in the TV show "Jardins et Loisirs". For this beautiful property in the countryside, which I took care of before creating my company, the challenge was to arrange the garden in a very structured way without losing the magnificent view. The pool, too close to the house, ended up being moved down. I have multiplied geometric shapes and natural trees, and designed a staircase where the lawn is invited. Here is a Belgian high-tech company, world leader in its market! Unfortunately, his outward presentation did not express any of this. So I designed this environment sober and serious, without taking itself seriously, a bit like in a comic book Spirou.